SMALL FOOTPRINT; 320 x 500 mm. Create geometry of the array (paraffin size, needle diameter, number of spots and spacing or pitch between the spots). Introduce rows/columns or spot groups of spacing to separate the various specimens. Define a library of up to 5 TMA templates to be re-called and re-used in different TMA projects. Computer assisted and automated tray that ensures precise and rapid positioning of the paraffin blocks while in use. Sample holder to position up to six standard histological cassettes. Needle Size: 0.6, 1.0, 1.5 & 2.0 mm – It is also possible to request 3.0 and 5.0 mm needles. 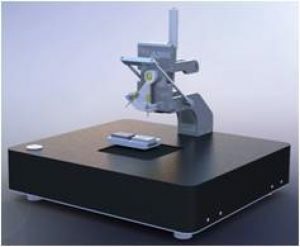 Automated and computer guided needle positioning to help operator to construct the array, avoiding errors that could endanger TMA quality and speeds up the process. Accurate and automated regulation of the core insertion depth. EP 1,068,528 granted 08/02/2006 and validated in AT, BE, CH, CY, DE, DK, ES, FI, FR, GB, GR, IE, IT, LU, MC, NL, PT and SE; and CA 2,318,984, issued 04/28/2009.